As anticipated, Apple CEO Tim Cook was among a number of tech executives who attended a summit with U.S. President-Elect Donald Trump on Wednesday, securing a close seat on the 25th floor of Trump Tower in New York City. "There's nobody like the people in this room, and anything we can do to help this go along we're going to do that for you," Trump told the executives, according to the Associated Press. "You call my people, you call me, it doesn't make any difference. We have no formal chain of command." 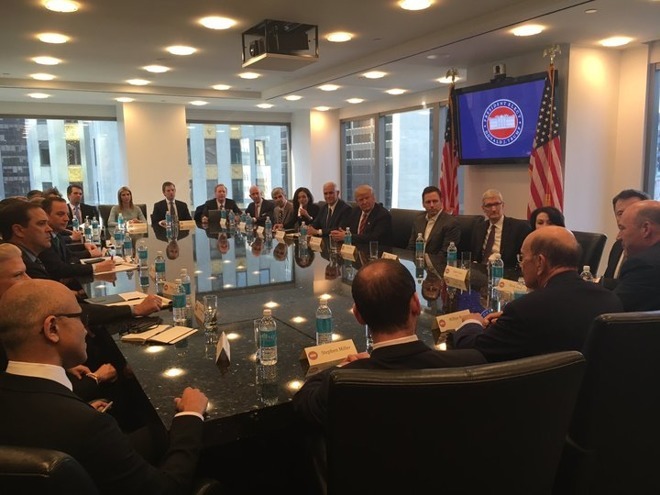 Cook found himself two spots away from Trump, blocked only by well-known investor, Facebook board member and Trump supporter Peter Thiel. Other tech executives present included the likes of Alphabet's Larry Page and Eric Schmidt, Amazon's Jeff Bezos, Facebook's Sheryl Sandberg, Microsoft's Satya Nadella, IBM's Ginni Rometty, and Tesla's Elon Musk. Also in attendance were three of Trump's children —Eric, Ivanka, and Donald Jr. —and Vice President-Elect Mike Pence. While most of the details of the summit are still secret, Trump promised the room's business elite that he would "make fair trade deals," and "make it a lot easier for you to trade across borders" with fewer restrictions. A number of the people present have been openly critical of Trump and/or his political positions. 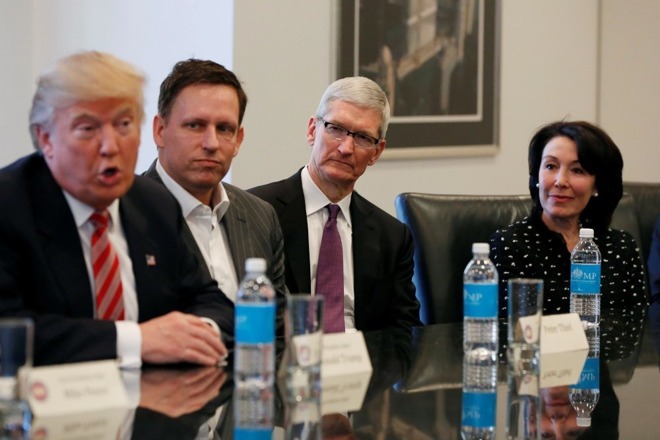 Trump, in fact, attacked Apple during his election campaign, arguing that it should bring manufacturing back to the U.S., and calling on supporters to boycott the company over its refusal to write a backdoor into the iPhone of San Bernardino shooter Syed Rizwan Farook. Cook and Musk are meeting with Trump after the main summit. While Musk is a member of Trump's Strategic and Policy Forum, Cook doesn't have any such attachments.